Our company is located in Ningbo City. Our main business is beauty accessory, bath accessory ,food container etc . 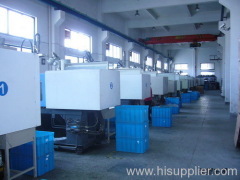 We are very experienced in designing new products and making high precision moulds in the plastic injection field. We have 6 senior engineers with 10 years' working experience. We have 14 sets of advanced mould making equipment and 10 sets of precision plastic mould injection machines with different capacities. We fully understand the best quality of products is most important for clients. We have done very well in the domestic market in recent years; We also expect to perform well in the international market.